Chelsea Book is a second year Occupational Therapy student originally from NSW. 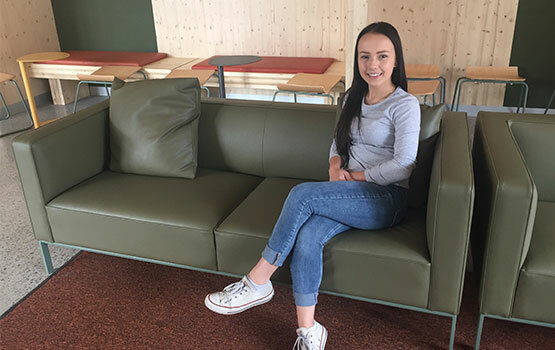 Last year she lived in the student village at Peninsula campus and is now a Resident Advisor living in the studio apartments at Gillies Hall. Chelsea’s parents supported her decision to move to Melbourne and she says living on campus offers an environment that supports students personally, as well as throughout their studies. The Peninsula campus also suits Chelsea. Moving into a new studio apartment added a different element to living on campus for Chelsea. Her initial thoughts were that individual apartments could be a bit isolating, but it has in fact proven to be completely the opposite. Chelsea helped organise some of the Monash Residential Services student orientation activities; her favourites being the Frankston Amazing Race, City Scavenger Hunt and the commencement dinner. Chelsea is loving her time studying at Monash and has plans to graduate with honours.